Caspase-3 is an active cell-death protease involved in the execution phase of apoptosis, during which cells undergo morphological changes such as DNA fragmentation, chromatin condensation and apoptotic body formation. Caspase-3 DEVD-R110 Fluorometric and Colorimetric Assay Kit provides a simple assay system for fast and highly sensitive detection of caspase-3 activity either by fluorescence or absorbance in mammalian cells. 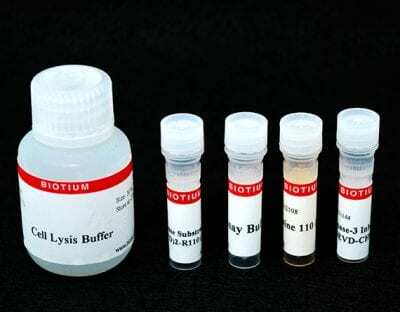 The fluorogenic and chromogenic substrate (Ac-DEVD)2-R110 contains two DEVD tetrapeptides and is completely hydrolyzed by the enzyme in two successive steps. Cleavage of the first DEVD peptide results in the monopeptide Ac-DEVD-R110 intermediate, which has absorption and emission wavelengths similar to those of R110 (Ex/Em= 496/520 nm) but has only about 10% of the fluorescence of the latter. Hydrolysis of the second DEVD peptide releases the dye R110, leading to a substantial fluorescence increase. Although fluorometric detection of the end products is preferred because of the superior sensitivity, detection by absorbance is also possible. In fact, the extinction coefficient ofR110 is 10 times higher than that of p-nitroaniline (pNA), a dye commonly used in chromogenic substrates, making R110-based substrates significantly more sensitive than pNA-based substrates, even by colorimetric detection. The assay kit includes Ac-DEVD-CHO, which is a caspase-3 inhibitor and can be used as a negative control. Also, R110 is provided in the kit for generating a standard curve, which can be used for quantifying caspase-3 activity. Note: While caspase-3 preferentially cleaves the consensus sequence DEVD compared to other substrate sequences, other caspases also can cleave DEVD efficiently. Overlapping caspase substrate recognition limits the usefulness of caspase substrate peptides for distinguishing between different caspase activities in cell lysates. Sensitive: The enzymatic reaction forms intensely yellow colored and highly green fluorescent rhodamine 110 (R110) product. Versatile: Compatible with both fluorometric and colorimetric detection systems. Biotium also offers the Caspase-3 DEVD-R110 Fluorometric HTS Assay Kit (catalog # 30009), a one step homogenous assay for high throughput screening (HTS) using fluorescent-based measurement. For real-time detection of caspase-3 activity in intact cells, see our novel NucView®488 Caspase-3 Substrate. 1. Cell Death Diff. 6, 99 (1999). 2. J Biol Chem 274, 11549 (1999). 3. J Biol Chem 275, 288 (2000). 4. Biochemistry, 38, 13906 (1999).